I ate a lot of couscous in the early '00s. The Near East brand boxes that come with seasoning packets make couscous a fast and easy side dish (I was a particular fan of either the Parmesan or the Roasted Garlic and Olive Oil flavors). Now though, I hardly ever have it. I thought revisiting the dish might be a good opportunity to break out of my usual flavor profile. My creative cooking tends to hover somewhere between American and Italian it seems. So, with this couscous dish, I wanted to push beyond those boundaries. 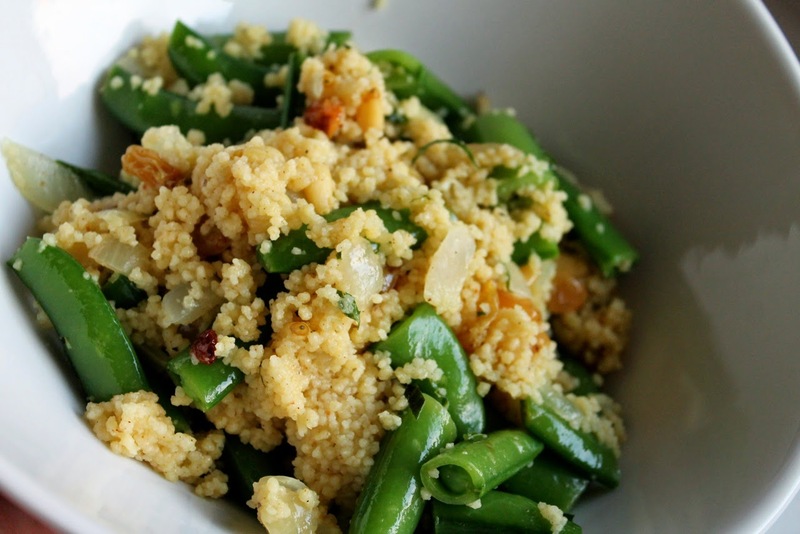 Couscous originated in northern Africa, so I wanted to spice profile of this dish to be more aligned with that area while also taking advantage of seasonal sugar snap peas, which are so good right now. I was pleased with the results of this dish. The couscous was fragrant but not overpoweringly spicy. The raisins added a bit of welcome sweetness that played well with other ingredients. We ate this in large portions as a salad, but it could certainly made a great side--I bet it would be perfect with lamb. 1. Bring a medium saucepan of water to boil. Add the sugar snap peas and cook 2 minutes. While the peas cook, prepare an ice water bath, then transfer the peas to the bath to stop cooking. When cooled, drain and set aside. 2. Bring the chicken broth to a boil (bring to boil while performing step 3). 3. Heat olive oil in a medium saucepan over medium heat. Add onion, season with salt and sauté until softened, about 5 minutes. Add the garlic, pine nuts, nutmeg, cinnamon and curry powder. Stir to combine and cook until fragrant. Add the raisins and fresh mint. 4. Add the boiling chicken broth and cooked peas to the saucepan with the onions and seasoning. Stir in the couscous, cover the pot and remove from heat. Allow to sit for 5 minutes, then uncover and stir to fluff. Serve in bowls. This was good! Loved the aroma and the raisins.